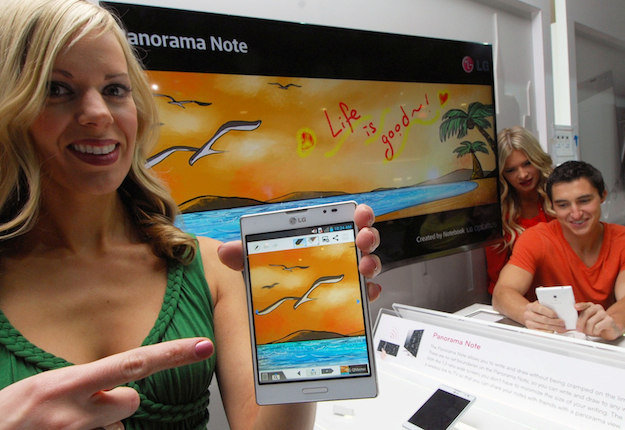 Sorry mobile fans, LG didn’t announce any new smartphones during its CES 2013 press conference. (Although it did talk about some washing machines which will use NFC to connect with your Optimus phone, if that’s your thing.) For the rest of us, the big day will come at the end of February when LG attends Mobile World Congress 2013 in Barcelona. “At MWC next month, and throughout the year, we’ll be bringing more tier-one handsets in various screen sizes,” LG’s VP of Marketing’s James Fisher said at Monday’s press conference. His words confirmed what we had already suspected, but contradicted rumors that the Optimus G2 would appear at the show, alongside a new tablet, and a smartphone-tablet hybrid with a 5-inch, 1080p screen. With none of them showing up at CES, they’re now almost guaranteed to appear at the Barcelona show – provided they’re real, of course. In with all the home appliance talk, LG did announce a new software feature which will appear soon on the LG Optimus Vu: II. Called Panorama Note, it provides a large, virtual canvas on which you can jot notes, draw pictures or anything else you’d normally use a big piece of paper for, then zoom in or out on relevant spaces. It’s like having one of those huge desktop notepads in front of you all the time. A mini map helps you navigate around the pad, and the Vu’s stylus makes writing notes more natural. Sadly, LG hasn’t released the Vu: II in many markets, so it’s unknown whether Panorama Note will come to other LG phones in the future for us to try out, however the press release notes it’ll be hitting “specific target devices” in 2013. Perhaps it’ll tie in with the release of a Galaxy Note 10.1 challenger from LG? We should find out more at Mobile World Congress, which begins on February 25 in Barcelona, Spain.